George Washington University Law Professor Jonathan Turley says that Andrew McCabe may have exposed criminal wrongdoing on the part of James Comey in his statements lashing out at President Trump and AG Sessions for his termination. McCabe claimed, in a Friday statement following his firing, that he had been “singled out” after “unrelenting” attacks by President Trump and critics. Turley sees a line of text that he says could be interpreted as incriminating Comey, not only as a leaker but also for lying to Congress. McCabe is accused of lying to FBI investigators in statements made about giving information to the Wall Street Journal about the Clinton “investigation” and the Clinton Foundation. 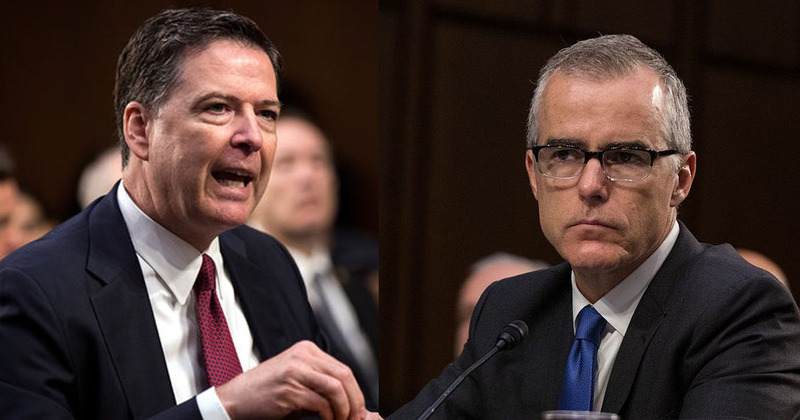 McCabe claims he not only had the authority to share the information with the media but that he did so with the full knowledge of Director Comey. He fails to point out the deceptive nature of Comey lends itself to technically “telling the truth” as a protection from it. One could see the word-parsing dirty cop contending that McCabe, not himself, was the anonymous source and also claiming that he never specifically authorized McCabe, that he had that kind of authority by virtue of his position. Being aware of something taking place is different from authorizing it. There is no indication that he was asked specifically whether or not he was aware of such an action by someone else. It’s thin but perhaps it’s enough. Turley notes that “Comey repeatedly stated that he had never leaked nor caused anyone to leak information to the media.” At a minimum it seems he never stopped them either. It all depends on what the definition of ‘is” is. ‘Is’ all a nonsense. As James says: Arrest the lot of them. There is plenty of evidence already in for that partial draining of the swamp to take place. just arrest all of them and be done with it.